Last year I participated in World Book Night for the first time—an experience that was both gratifying and humbling. Passing out free books in a well-lit public location might sound like a situation in which one would be happily welcomed. But the responses I received were most definitely mixed and included irritation, suspicion and pretending-I-didn’t-exist (admittedly, a useful strategy for some NYC moments). This won’t stop me from participating again, or at least applying to become a giver for the 2013 event, scheduled to take place on April 23. If you’re interested in doing the same, you can visit the organization’s web site here. The 2013 book list—an interesting mix of genres and eras are included— is also available. 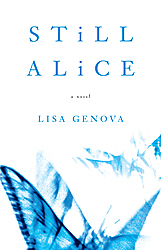 Among this year’s selections is Lisa Genova’s Still Alice. I read the book about six months ago and found it both well written and deeply depressing. Ms. Genova’s account of an accomplished woman’s loss of self after the onset of Alzheimer’s is effectively drawn in a first-person narrative, and the reader is privy to her struggle to deal with the accompanying rage and confusion. The book (and real-life cases like Iris Murdoch) undermines the wistful fantasy I have that an active life of the mind can serve as protection from this fate. I think Still Alice is worth a read if one is prepared for its mostly bleak tone. However, since I handed out Rebecca Skloot’s award-winning The Immortal Life of Henrietta Lacks last year, I hope to have the opportunity to give away something a bit more upbeat from World Book Night’s list. Tina Fey’s Bossypants anyone? There does seem to be evidence that an active intellectual life can forestall or reduce some of the mental effects of aging. Totally different than Alzheimer's, though. Disease doesn't care how smart we are. I remember your World Book Night experience from last year! The Henrietta Lacks book is currently a "Rave and Fave" in the Mississauga system - among a group of books prominently featured in every library. Also from 2012 World Book Night, I ended up reading "Because of Winn Dixie," which was wonderful. Terrific list this year! I highly recommend The Lightning Thief. Rick Riordan has a huge, almost fanatical following of young readers. I am also interested in the dust bowl book, as a huge Grapes of Wrath fan. I love Kate DiCamillo's books, particularly The Magician's Elephant. I met her for about two minutes at the Book Expo in NY a couple of years ago. She was unaffected and friendly and happily signed three copies of her book for us. I haven't read The Lightning Thief, though it is a favorite of J's and helped get her interested in mythology. (I did see the movie, which I imagine did not entirely do the book justice, though I enjoyed seeing Uma Thurman as Medusa.) So good to know that some children's literature is thriving. Oops, just saw this comment, long after the fact. How nice you met Kate DiCamillo! From the library perspective, children's lit is thriving, even burgeoning. It makes me a bit sad, as I was trying to get mine published during a drought. When I'm not being selfish, though, it's great.